I find myself not only rebelling against societal norms and pressures, but also those I set myself. Sometimes, I am indeed my own worst enemy. One of the ways I find myself dealing with those feelings is by doing something random. Something different. Something that breaks up the monotony that can settle into the crevices of every day life. Feeling constricted by the confines of the schedule I personally have laid out? Throw it all out the window and declare it book day, my self-declared roving holiday celebrating books. Too much stuff to get done and not enough time to get it done? That would be the perfect time to start learning the 1920's Charleston. Making too many staid purchases like cat food and paper towels? Make sure that the dish brush is a whimsical pink elephant. And after telling myself that I'm just not into tofu, I found myself throwing a package into the grocery cart. 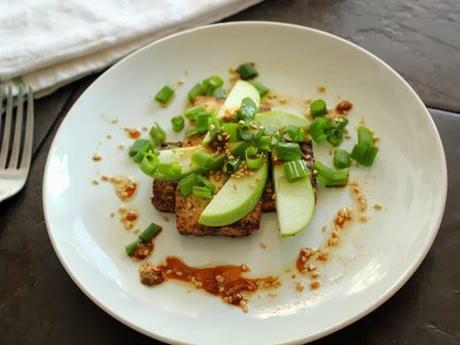 Here I pan fried slices of tofu, drizzled them with a soy-sesame-apple sauce, and then served with scallions, sesame seeds and slices of granny smith apple. Rebelling against yourself can lead to a surprisingly delicious dinner. Being your own worst enemy can bring you full circle into being your greatest ally. Need some more ideas for tofu? Cooking Light has you covered with this recipe slide show! To make the soy sesame sauce: place everything in a bowl and whisk. To make the tofu: Take the tofu out of the package and blot with a paper towel to remove the moisture. Slice the tofu into slices about 1/2-inch thick. Heat canola oil in a saute pan (I used my trusty cast iron) over high heat. Add tofu slices. Brown one side, then flip and finish browning the other side. Remove from pan, serve with the soy sesame sauce, some slices of apple, and a generous sprinkling of green onions and sesame seeds.